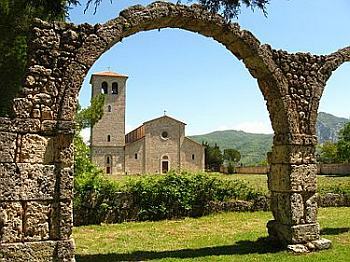 The old monastery grounds are in the hills near the town of Castel San Vincenzo in the province of Isernia, near the source of the river Volturno about 100 km north of Naples. We have known for a long time of the existence of the monastery from a twelfth-century manuscript, the Chronicon Vulturnense, written by a monk of the monastery in 1130. He used sources from the eighth, ninth and tenth centuries, probably in the monastery archives. The manuscript includes many images and is in the Vatican Library. We know that the monastery was founded in 731, a very important period in shaping the future of Europe: the Roman empire was gone; the terrible Gothic wars were finished; and the productive and interesting period of the Longobards was about to finish up in 774 when the “father of Europe,” Charlemagne arrived on the scene. He founded the Holy Roman Empire and also put his seal of approval on the formation of the Vatican (or Papal) States, that large chunk of church property in central Italy that would then stand in the way of a united Italy for the next 1000 years. The other player at about the same time was Islam. The Muslim faith had successfully expanded in many directions, into Spain, the Balkans, and it would soon make successful moves on Sicily and part of the southern Italian mainland. The community of San Vincenzo al Volturno had about 300 members by the early 800s and had acquired other properties elsewhere in central and southern Italy. Then, trouble started. The Chronicle reports that in 848 the grounds were severely damaged by an earthquake. Then, in 860, what had by then become the Muslim center of Bari had to be bribed not to sack the monastery. Such events were termed “Saracen raids” at the time. That meant “Arab raiders.” (After the later Arab collapse in the face of Crusaders and Mongols, such raids continued, this time by Ottoman Turks; “Saracen” continued to be applied to them, as well. Raids lasted into the 1500s along the coasts of southern Italy.) In 881, Saracens raided and burned the monastery, and surviving monks fled to Capua. They returned in 914 to rebuild in a more defensible position on the other side of the river. The arrival of the Normans and their conquest of southern Italy (thus, beginning the kingdom of Sicily/Naples) eventually led to the breakdown of any independence on the part of the San Vincenzo monastery, even though such independence had been consecrated by various popes. In 1349 a new earthquake destroyed the monastery and left the area open to the expansion of the nearby abbey of Monte Cassino. The monastery of San Vincenzo was occupied by fewer and fewer monks, and by the mid-1600s the monastery and its properties were taken over by Monte Cassino. The abandonment of the monastery, the removal of its goods to Monte Cassino, natural changes in the course of the Volturno river (flooding sections of the premises), locals picking through what was left and carting it off —all that led to the slow physical disappearance of the monastery and the fading from memory that there had ever even been such an important light of monasticism here. The comeback (archaeologically speaking) started in the 1830s with piecemeal discoveries, but real progress didn't start until much later in 1935 when archaeologists started to restore some frescoes and make photographic surveys. The property was further damaged by the battles of WWII. Recall that this is where the formidable German defensive lines were strung coast to coast across Italy to block the Allied invasion from Salerno as it swept up towards Rome. In the 1970s Dom Angelo Pantoni, a monk from Monte Cassino excavated part of the area, and the San Vincenzo Project, that is, large-scale excavation of the property, was supervised by Richard Hodges of the University of Sheffield beginning in 1980. He continued supervising work on the premises through the 1980s and 90s. (His scholarly findings appeared in book form as Light in the Dark Ages: The Rise and Fall of San Vincenzo al Volturno, published by Cornell University Press, 1997.) Interestingly, in 1989 San Vincenzo al Volturno became home to a new monastic community, the Benedictine nuns of Connecticut, Regina Laudis. Since 1999 the project has been directed by Federico Marazzi, of the Suor Orsola Benincasa university of Naples.